Far from frightful, the weather outside here in Bellingham has actually been perfectly acceptable of late. In fact, today (Friday December 17th) was just about the most perfect winter day imaginable. But this is the Pacific Northwest - it's going to get gruesome at some point. And when it does, golfers better make sure they're outfitted correctly. Because cold, driving rain can make golf hard work. In our review of outerwear garments, we've considered the three evils of bad, winter conditions - cold, rain, wind - and suggested a few pieces we are confident will allow you to shake hands on the 18th green more or less as dry and warm as you were when you started. There's raingear, items ideal for cool and cold mornings and a handsome windshirt that will make you the best-dressed member of your fourball. And at the bottom, there are links to the best waterproof golf shoes, waterproof hats and accessories that can be every bit as important to a comfortable round of golf as your clothing. In all cases, I have given you the MSRP. Spend just a few minutes surfing the various online golf shops, or visiting Bellingham's pro shops of course, and you'll surely be able to find each item for a good deal less. Click here to find out what that means. 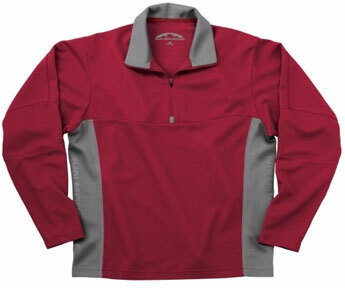 20,000mvt breathability rating - click here. One look at the price, the list of bullet points (left) and the lifetime waterproof guarantee tells you all you need to know about the Hurricane V2 - this is state of the art equipment. If you gave up playing in the rain because the raingear you once owned had trouble keeping you dry and comfortable even in a light drizzle, then I urge you to try this on and reconsider. For starters, the 30,000mm waterproof rating is about as high as any material can be before you get into rubber, glass, steel or the polycarbonates Nalgene uses for its water bottles. The 20,000mvt breathability score is right up there too. So it does the basics brilliantly. But there's so much more to the Hurricane V2 than just keeping the rain out. For a rain jacket, it is both surprisingly stylish and extraordinarily comfortable. The X-Static Stretch Lining, waterproof zippers, chin guard, and left-pocket ball cleaner are all very nice touches, but the feature that stands out most, in our opinion, are the lycra action cuffs and wrist rain channel which ingeniously create a comfortable, weatherproof seal around your wrists. The game's greatest scientific minds clearly aren't just thinking up new ways to get a golf ball to travel another yard or two, creating amazingly realistic virtual golf simulation systems, or designing ever-better products that tell you how far you have left to the pin. It appears they make rain jackets too. Sizes: S-XXL (jacket and pant). Price: $450 (jacket), $300 (pant). More info, including size chart, here. PACLITE and Stretch PACLITE fabrics. 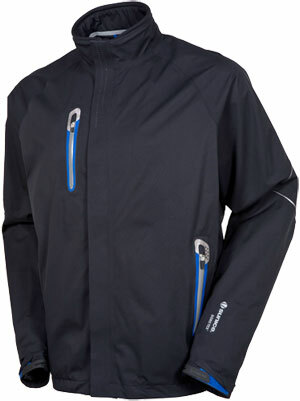 Extreme breathability and durable wind and waterproofness. Minimum weight and easy packability. 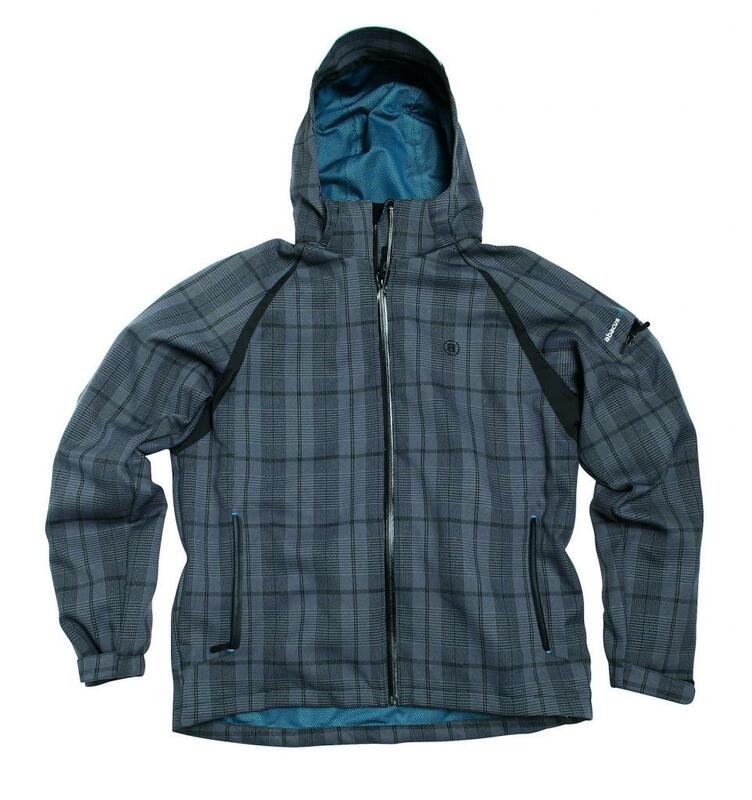 Two way zipper allows front of jacket to lay flat when putting. Reach across chest pockets for secure storage of essentials. Inner Kayak Collar for added weather protection. Bemis film abrasion patches on shoulders and hips. 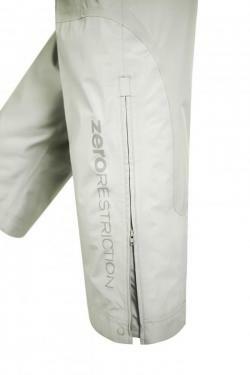 Front hand pockets feature zippered pass-through for access to pants. Adjustable waistband with gripper elastic and zippered fly. Rear pocket provides ample storage for glove or scorecard. Leg zippers with Rain Gutter provide easy on/off over golf shoes. Spat Hook snap and hook system helps keep water out of your shoes. You'll note from this jacket's similarly extensive list of bullet points it occupies the same rarified atmosphere as the Sunice Hurricane, providing a level of waterproofing, breathability and comfort which justify the price tag and which you just won't find in lesser clothing. Okay, you have to be a pretty serious golfer to fork out $750 for a rainsuit but, of course, you're not restricted to wearing it on a golf course and with one of these on you are more or less assured or staying dry even in heavy rain. Indeed, BellinghamGolfer stood in the shower for five minutes with it on and watched as the water collected in beads then slid off the jacket before getting anywhere near his skin. He emerged perfectly dry. First time you try it on, you'll likely look around for all the stuff that makes this jacket so expensive. It is so light you might just as well be wearing something a quarter the price. But, of course, that is the beauty of the Linkstorm. It is so unobtrusive and inconspicious and allows for a very wide range of motion you needn't make any adjustments to your set up and swing. The same is true of the pants which are light and comfortable enough to make it feel like you aren't really wearing rainproof trousers. The zippers and hook snap at the bottom are such a simple idea yet very effective, keeping water from getting into your shoes and making the trousers very easy to get on and off, even when wearing golf shoes. Waterproof laminated polester mesh lining. Two words - style and pockets. Abacus is a Swedish brand, so you know somewhere in its catalogue there's going to be something a little quirky or unconventional. The Canmore's styling isn't out there necessarily, but the plaid look might not be for everyone, not on a rain jacket anyway. Indeed, it took Bellinghamgolfer a day or two to come round, but now we say Ja! Something else the Canmore has going for it, is that while it feels quite rugged and heavy duty it is, in fact, perfcetly light enough to play golf in. The removeable hood makes it suitable for use away from the course too. Lastly, the big zipped pocket in the garment's back is really very useful. You might get an odd look the first time you go rummaging for balls/tees/scorecard in there, and our first reaction was 'those crazy Swedes'. But it actually works well, better than a small, wet trouser pocket. Colors: Black, Black/White Accents/White Piping, Green/Black Accents/White Piping, Sandstone/Black Accents, Navy/Black Accents/White Piping, White/Black Accents/Royal Piping. FJ Protect Waterproof System beads and sheds water. Ever since Payne Stewart cut the sleeves off his rain jacket at the 1999 US Open, the sleeveless or short-sleeve rainshirt has become a trusted and indispensable part of every serious golfer's wardrobe. 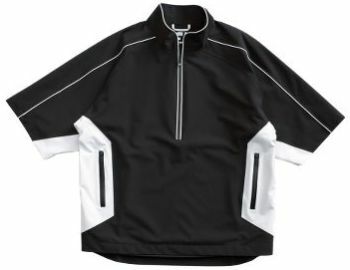 The Footjoy Tour SS Rainshirt is about as good as they get - waterproof obviously, thick enough to provide some warmth, and with sleeves wide and roomy enough to prevent the tugging and resistance Stewart complained of before taking a pair of scissors to his garment. The pockets are cavernous, and it comes in some pretty cool color combinations. Check out the green one. Sizes: M-XXL (Small in select colors). Colors: Red/Charcoal, Port/Black, Ocean/black, Graphite/Black, Cactus/Black, Black, Amberbock/Graphite. 5% spandex (comfortable and stretchable). and out of the way). The Sun Mountain Second Layer has actually been the ideal top layer the last few weeks in Bellingham (okay, there were those two days around Thanksgiving when the temperature dropped to about 20 degrees and we got all that snow - conditions when you definitely needed another layer or two on top). It's not suited for harsh winter weather, but on coolish days around 40 degrees, such as we've had here in 98226-Land, it has fitted the bill perfectly. 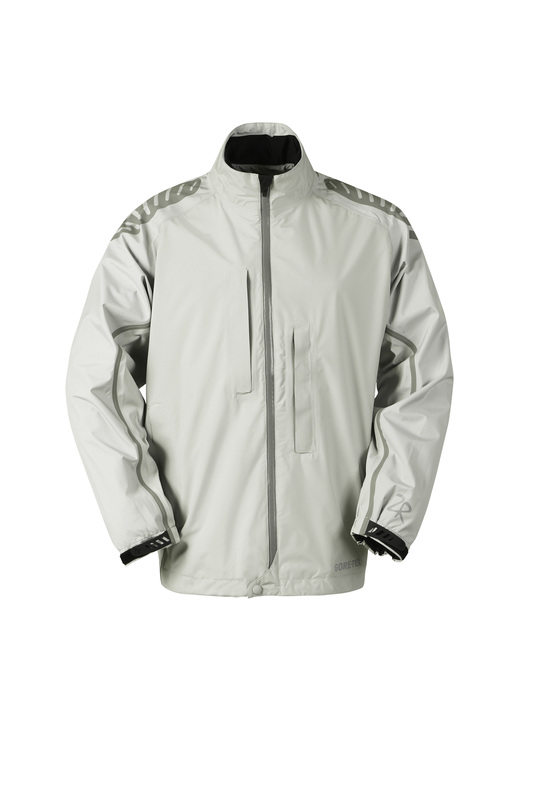 Good-looking and nicely stretchy, the Sun Mountain Second Layer could well be Bellinghamgolfer's most worn item in 2011. Sizes: S-XXL (Small in select colors). Colors: Light Charcoal, Black, Navy, Bottle, Heathered Blue, Vanilla, Tweed. Combines quality, style and function. It isn't until you try on clothing made of Merino wool that you realise not all wool is made the same. Today, the term 'Merino' actually refers to any top-quality wool - not just that of Merino sheep. It is extremely soft and does an excellent job of regulating body temperature, wicking perspiration away from the body and providing some insulation. The Fairway and Greene Half-Zip Windsweater perhaps isn't what you'd wear on a frosty morning with your breath visible to golfers on an adjoining fairway (although combining it with the FJ Base Layer and a woolly hat would certainly work), but it is perfect for use on chilly, windy days thanks, not only to the wool outer but also the very pleasant-feeling nylon inner. It's a very handsome piece of clothing too. Easy to care for fabric that avoids shrinking and wrinkling. Conforms to body and retains warmth. 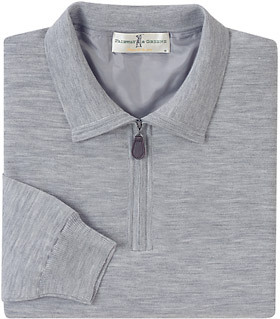 Crew-neck collar designed specifically for golfer. Comfortable and allows wide range of motion. Anti-microbial finish helps eliminate odor. Lock-stitched hem provides re-inforced construction with tailored look. Double-stitched seems ensure extra durability. Someone once asked why, when the human race had put a man on the moon, did it take so long to put wheels on luggage. Similarly, if we (and when we say 'we' we are recognizing the fact we played no part in this) can put together a global system of interconnected computer networks that use the standard Internet Protocol Suite (TCP/IP) to serve billions of users worldwide (Wikipedia's definition of the Internet), why did it take us so long to work out that multiple thin layers work better than one chunky woollen pullover at combating the cold? 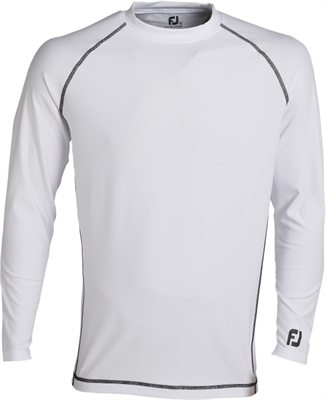 The FJ Performance Base Layer fits very snug to your body without being 'sticky' and does exactly what it was designed to do - keep your torso warm. And you don't have to be warm to begin with; the Base Layer will help raise your body's temperature if it starts out cold. Broad-shouldered, muscular types will no doubt be seen making the base-layer their only layer in an effort to showcase their impressive physiques, but the average golfer will find that it works superbly under a collared T-shirt, mock-turtle, V-neck sweater, the Sun Mountain Second Layer (above) or, best of all, the Performance Mid-Layer Half-Zip Pullover. And it's breathable so sweat won't build up if it suddenly gets warmer or you walk up a steep hill.